Here are the two I'm comparing. Edited by folkcafe, 24 April 2018 - 08:54 AM. Here is one from today. A beautiful day out on the water and finally some warm weather. We went fishing out of Seabrook and the water was calm and very little wind. A step in the right direction. Anyway the jist of this is another tool to monitor water temps and more importantly with squid, the warm water currents and temp trends. Hope this is helpful to some. Interests:Fishing, hunting, mushrooming, wild food gathering, prospecting for minerals, traveling, gardening and orcharding and cultivation for wildlife. Outdoor writing: Subsistence living, living off the grid, foraging wild plants, mushrooming, prospecting, hunting and fishing. The one problem with SSTs is that the granularity often isn't good enough on the big picture view, which would allow you to see trends. In addition, clouds can get in the way. Storms (or the lack, thereof) can also affect the temperatures and mixing. That said, when you start to see those little cyan-colored blobs start to swirl in, it's time to head to the piers and bridges. Based on my observations, the full moon also plays a big factor. They seem to head in a week or so after the full moon to feed and then, I imagine, breed at the next full moon. Seems to me the bigger question is the overall temps in general. I get the sat data is not a complete picture with limitations but viewing the reports of individual harbor temps, we still seem a ways off. Or am I missing something in the generalities often made such as 50 degrees and the incoming warm currents? Forecasting is still a crap shoot. Every year seems the same, hope they show up when you are there. Read through some study information and was surprised at how unpredictable they are compared to many other fish species. I'm still going to watch these temps till there is a report of ink somewhere and see if there was any correlating trend. Gives me something to do while waiting. I'd rely on the buoy's before sst charts for inshore. Right now block island and montauk are 45, vineyard sound is closer to 47, newport is 47, and woods hole is almost 49. And those are surface temps. It can be warmer or colder 50 feet down. But, it's almost time. Hopefully my boat will get in soon. I'm back in the pack, and only a handful of boats have cleared out and gotten dunked. I'll tell you though, with cold and rainy days like today, I'm not feeling the itch yet. 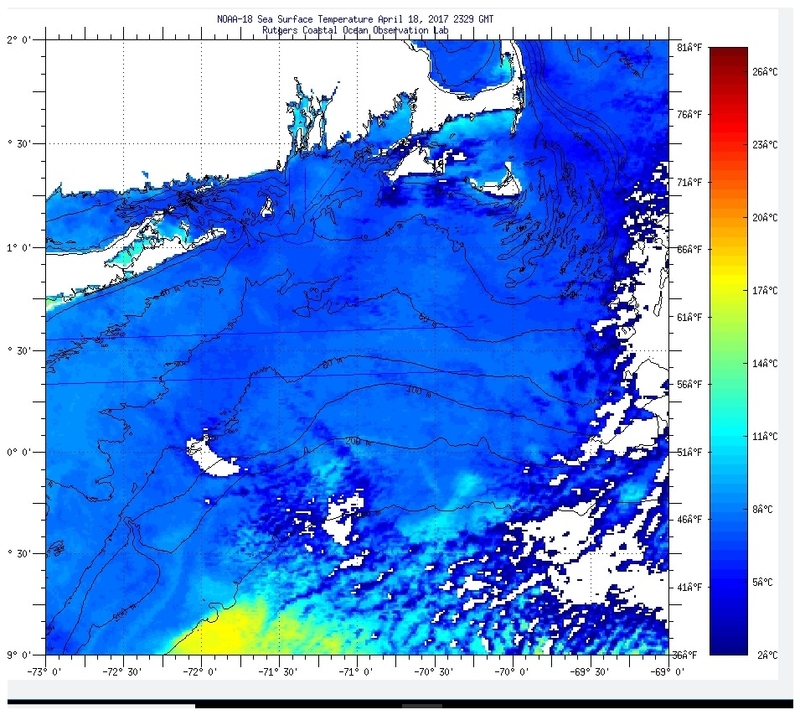 I'm only looking at the sst to look for warm current coming in. I've read a few papers on squid migration and it is more than just the temps near shore. Clouds have been making it difficult to get a single image on it but if you look at the composites, you see the trends. What I am looking for is where I'll likely focus. 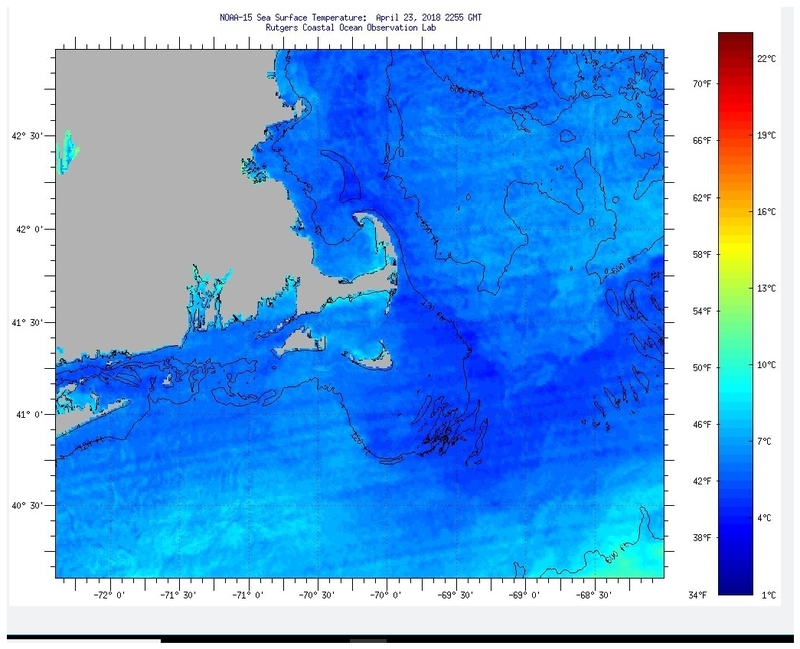 Nantucket Sound is warmer but there is more indication of warmer water coming up to Newport. I want to see if this correlates to the arrival reports this year. Simply something to do while we wait. I did the same thing a few years back... I looked at 3 years of SST animations in March, April, May and June and used the reports from this forum to see that there is, in fact, a correlation between water temps and inshore catches of squid. It also seems strongly linked to moon phases, with the biggest catch reports coming from 1 week after the full moon right up until 3-4 days before the next full moon. The biggest of the biggest catches seem to happen when the high tide falls just after sunset to 11 p.m. about 10-15 days after the full moon when the water temps at the Newport buoy is at least 48 degrees. I get it. I eat, live, and (hopefully not) die by charts when offshore fishing. I just don't look at them this early. You have to be careful with them at any time though. All of the free services, and most of the pay services, use composite images. You know that because every shot they post is a full and complete image with no cloud cover. Basically, what happens is cloud cover, fog, or other forms of moisture (ice crystals high in atmosphere for exaample) will cause large portions of a sat pass image to be unusable. 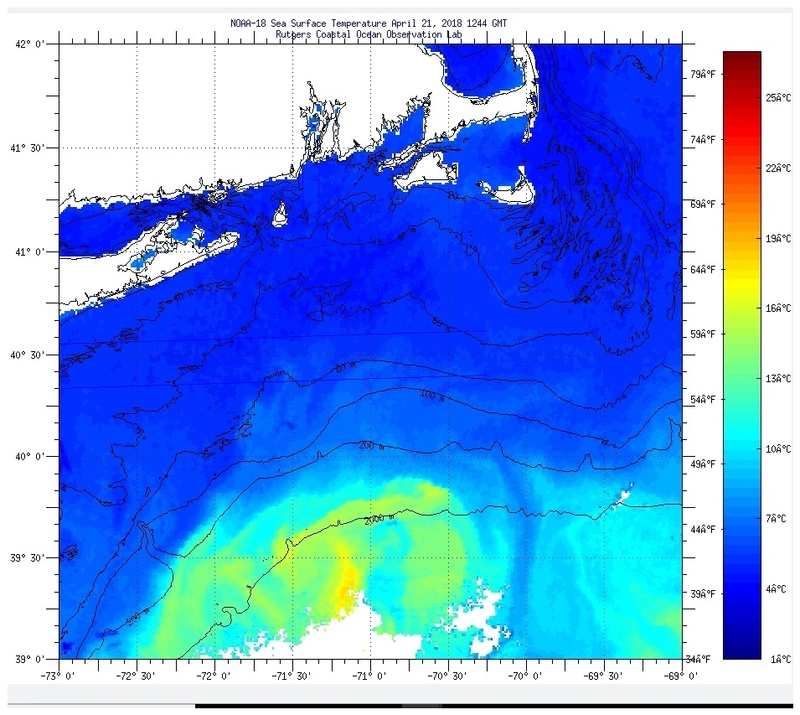 So sst services will stitch together the data they get from multiple passes over several days to try to fill out the territory, then they use some fancy modeling to fill in the gaps. The result is images with little or no relation to reality. And remember, if they are off only 20 miles, you can completely miss a break offshore. Worse yet if you are chasing one that doesn't exist. But there are sites that offer raw images. If there is cloud cover, the image is grey in that area. Then there are images which don't rely on clear skys that cn help you. Sub surface temp charts are very good at that. Add those to chlorophyl, mixed layer depth, and others, and you can see through the clouds. But it's a lot of work. Required when you are the only boat in 40 miles, but not so much for squid. Here, you can just listen to your network and find when they are in. Predictions are good, but reality rocks. But it's all academic until my boat goes in and I get it debugged. I'm at least a month late this year, and there are only a handful of boats that made it in ahead of me. Edited by greg ct, 01 May 2018 - 11:00 PM. https://earth.nullsc...=-70.412,42.352, Really cool animation of sea surface temps and currents. I love that site! It is often hard to describe to people what an eddy is and why it's different from a sliver or wash (my term). In the pic below, the circulation on the right is a true eddy. It has split off from the gulf stream and will hold fish. It it reaches the edge, it would be a very good target to look at further. The one on the left though is a different kind of circulation. It isn't really a part of the gulf stream (it's drawing shelf water into a circular formation and drawing some along with the stream current) and is nowhere near an area we can reach. If the gulf stream wanders a couple of hundred miles north, it would be fishable, but in a much different way.